Tucked a few steps up a side “street” (or stairs, really, as are all the streets in Vernazza except Via Roma), is Ristorante Incadese, also known as da Piva. 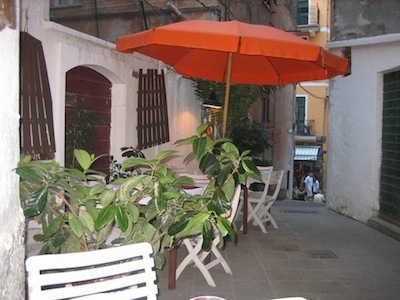 Though Vernazza is a small town of about 500, da Piva is often overlooked in favor of the more visible restaurants on the waterfront piazza. But later on in the evening, visitors frequently follow the sound of music to da Piva, when Piva, the owner, brings out his guitar to sing local Ligurian folk songs, many written by him, and other Italian favorites on request. At times, visiting musicians join in and the music goes late into the night. As much fun as this musical entertainment is all by itself, it is appreciated most by first enjoying the freshness, goodness and simplicity of the local specialties for which da Piva is famous. “Simple but good” seems to be the slogan that the locals use for their favorite food, and Piva delivers this in his cozy and casual trattoria of 15 tables, half of them inside and half outside, across the sidewalk. In Vernazza — and all of Cinque Terre — two foods dominate all others: pesto and anchovies (acchiuge in Italian). Put out of your mind whatever you think you know about anchovies. Caught in the clean seas along the coastline of the National Park of Cinque Terre, these small, fresh, firm white fish form the mainstay of the local diet. To eat them is to share in the essence of the place, which has been dependent on the sea for over 1,000 years. Anchovies are the prime catch. Three favorite local ways to eat anchovies are fried (acchiuge mista), salted (acchiuge insalata) and with lemon (acchiuge al/con limone), any of which can be enjoyed as an appetizer. For the next course, the primo, order the local pasta, trofie, or any other pasta, with pesto. Because the basil grown here is different from anywhere else, the pesto, too, is special, and redefines how pesto should taste. Follow this by the main course, the secondo, with Piva’s specialty, the local casserole called Tegame di Vernazza made with layers of tomato, potato and anchovies — another example of the combination being better than the sum of the individual parts. Have a glass or carafe of the house wine, a white wine made from the grapes of the vineyards terracing the mountains around you. The inexpensive house wine is light and appealing and matches the food perfectly. Or you can splurge and order a bottle of the white Cinque Terre D.O.C wine. For dessert, try the panna cotta accompanied by the local version of limoncello, called limoncino here. This is a bracing lemon liqueur, perfect as a digestive, and it doesn’t hurt your sleep, either. By now, if you have adopted the local dinner time of 8 p.m. (or later), the music may have started. Linger and enjoy it — you already have the best seat in the house!